and also because I wanted to see in what manner they would celebrate the festival, which was a new thing. I was delighted with the procession of the inhabitants; but that of the Thracians was equally, if not more, beautiful. and at that instant Polemarchus the son of Cephalus chanced to catch sight of us from a distance as we were starting on our way home, and told his servant to run and bid us wait for him. Polemarchus desires you to wait. There he is - said the youth - coming after you, if you will only wait. and in a few minutes Polemarchus appeared, and with him Adeimantus, Glaucon’s brother, Niceratus the son of Nicias, and several others who had been at the procession. 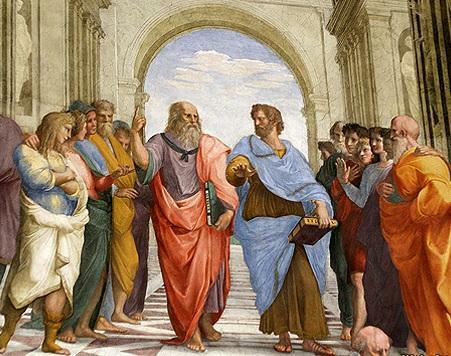 I perceive, Socrates, that you and our companion are already on your way to the city. But can you persuade us, if we refuse to listen to you? - he said. I replied: That is a novelty. Will horsemen carry torches and pass them one to another during the race? Yes, said Polemarchus, and not only so, but a festival will be celebrated at night, which you certainly ought to see. Let us rise soon after supper and see this festival; there will be a gathering of young men, and we will have a good talk. Stay then, and do not be perverse. and there we found his brothers Lysias and Euthydemus, and with them Thrasymachus the Chalcedonian, Charmantides the Paeanian, and Cleitophon the son of Aristonymus. He was seated on a cushioned chair, and had a garland on his head, for he had been sacriﬁcing in the court; and there were some other chairs in the room arranged in a semicircle, upon which we sat down by him. If I were still able to go and see you I would not ask you to come to me. But at my age I can hardly get to the city, and therefore you should come oftener to the Piraeus. For let me tell you, that the more the pleasures of the body fade away, the greater to me is the pleasure and charm of conversation. for I regard them as travellers who have gone a journey which I too may have to go, and of whom I ought to enquire, whether the way is smooth and easy, or rugged and diﬃcult. And this is a question which I should like to ask of you who have arrived at that time which the poets call the ‘threshold of old age’–Is life harder towards the end, or what report do you give of it? –I cannot eat, I cannot drink; the pleasures of youth and love are ﬂed away: there was a good time once, but now that is gone, and life is no longer life. Some complain of the slights which are put upon them by relations, and they will tell you sadly of how many evils their old age is the cause. For if old age were the cause, I too being old, and every other old man, would have felt as they do. But this is not my own experience, nor that of others whom I have known. How well I remember the aged poet Sophocles, when in answer to the question, How does love suit with age, Sophocles,–are you still the man you were? Peace, he replied; most gladly have I escaped the thing of which you speak; I feel as if I had escaped from a mad and furious master. His words have often occurred to my mind since, and they seem as good to me now as at the time when he uttered them. For certainly old age has a great sense of calm and freedom; when the passions relax their hold, then, as Sophocles says, we are freed from the grasp not of one mad master only, but of many. for he who is of a calm and happy nature will hardly feel the pressure of age, but to him who is of an opposite disposition youth and age are equally a burden. they think that old age sits lightly upon you, not because of your happy disposition, but because you are rich, and wealth is well known to be a great comforter. You are right, he replied; they are not convinced: and there is something in what they say; not, however, so much as they imagine. for to the good poor man old age cannot be a light burden, nor can a bad rich man ever have peace with himself. but my father Lysanias reduced the property below what it is at present: and I shall be satisﬁed if I leave to these my sons not less but a little more than I received. the makers of fortunes have a second love of money as a creation of their own, resembling the affection of authors for their own poems, or of parents for their children, besides that natural love of it for the sake of use and proﬁt which is common to them and all men. And hence they are very bad company, for they can talk about nothing but the praises of wealth. either from the weakness of age, or because he is now drawing nearer to that other place, he has a clearer view of these things; suspicions and alarms crowd thickly upon him, and he begins to reﬂect and consider what wrongs he has done to others. And when he ﬁnds that the sum of his transgressions is great he will many a time like a child start up in his sleep for fear, and he is ﬁlled with dark forebodings. – hope which is mightiest to sway the restless soul of man. How admirable are his words! and when he departs to the world below he is not in any apprehension about offerings due to the gods or debts which he owes to men. and therefore I say, that, setting one thing against another, of the many advantages which wealth has to give, to a man of sense this is in my opinion the greatest. Well said, Cephalus, I replied; but as concerning justice, what is it? – to speak the truth and to pay your debts–no more than this? And even to this are there not exceptions? Suppose that a friend when in his right mind has deposited arms with me and he asks for them when he is not in his right mind, ought I to give them back to him? No one would say that I ought or that I should be right in doing so, any more than they would say that I ought always to speak the truth to one who is in his condition. But then, I said, speaking the truth and paying your debts is not a correct deﬁnition of justice. I fear, said Cephalus, that I must go now, for I have to look after the sacriﬁces, and I hand over the argument to Polemarchus and the company. To be sure, he answered, and went away laughing to the sacriﬁces. I should be sorry to doubt the word of such a wise and inspired man, but his meaning, though probably clear to you, is the reverse of clear to me. You mean that the return of a deposit of gold which is to the injury of the receiver, if the two parties are friends, is not the repayment of a debt,–that is what you would imagine him to say? To be sure, he said, they are to receive what we owe them, and an enemy, as I take it, owes to an enemy that which is due or proper to him– that is to say, evil. Or like shoemaking for the acquisition of shoes,–that is what you mean? And so of all the other things; –justice is useful when they are useless, and useless when they are useful? Then justice is not good for much. But let us consider this further point: Is not he who can best strike a blow in a boxing match or in any kind of ﬁghting best able to ward off a blow? –that was what you were saying? By friends and enemies do we mean those who are so really, or only in seeming? –Many a man who is ignorant of human nature has friends who are bad friends, and in that case he ought to do harm to them; and he has good enemies whom he ought to beneﬁt; but, if so, we shall be saying the very opposite of that which we aﬃrmed to be the meaning of Simonides. And instead of saying simply as we did at ﬁrst, that it is just to do good to our friends and harm to our enemies, we should further say: It is just to do good to our friends when they are good and harm to our enemies when they are evil? Nor can the good harm anyone? Then to injure a friend or anyone else is not the act of a just man, but of the opposite, who is the unjust? Then if a man says that justice consists in the repayment of debts, and that good is the debt which a man owes to his friends, and evil the debt which he owes to his enemies,–to say this is not wise; for it is not true, if, as has been clearly shown, the injuring of another can be in no case just. Then you and I are prepared to take up arms against anyone who attributes such a saying to Simonides or Bias or Pittacus, or any other wise man or seer? Shall I tell you who’s I believe the saying to be? Yes, I said; but if this deﬁnition of justice also breaks down, what other can be offered? He roared out to the whole company: What folly. Socrates, has taken pos- session of you all? And why, sillybillies, do you knock under to one another? I say that if you want really to know what justice is, you should not only ask but answer, and you should not seek honour to yourself from the refutation of an opponent, but have your own answer; for there is many a one who can ask and cannot answer. And now I will not have you say that justice is duty or advantage or proﬁt or gain or interest, for this sort of nonsense will not do for me; I must have clearness and accuracy. I was panic-stricken at his words, and could not look at him without trem- bling. Indeed I believe that if I had not ﬁxed my eye upon him, I should have been struck dumb: but when I saw his fury rising, I looked at him ﬁrst, and was therefore able to reply to him. Thrasymachus, I said, with a quiver, don’t be hard upon us. Polemarchus and I may have been guilty of a little mistake in the argument, but I can assure you that the error was not intentional. If we were seeking for a piece of gold, you would not imagine that we were ‘knocking under to one another,’ and so losing our chance of ﬁnding it. And why, when we are seeking for justice, a thing more precious than many pieces of gold, do you say that we are weakly yielding to one another and not doing our utmost to get at the truth? Nay, my good friend, we are most willing and anxious to do so, but the fact is that we cannot. And if so, you people who know all things should pity us and not be angry with us. How characteristic of Socrates! he replied, with a bitter laugh;– that’s your ironical style! Did I not foresee–have I not already told you, that whatever he was asked he would refuse to answer, and try irony or any other shuﬄe, in order that he might avoid answering? You are a philosopher, Thrasymachus, I replied, and well know that if you ask a person what numbers make up twelve, taking care to prohibit him whom you ask from answering twice six, or three times four, or six times two, or four times three, ‘for this sort of nonsense will not do for me,’–then obviously, that is your way of putting the question, no one can answer you. But suppose that he were to retort, ‘Thrasymachus, what do you mean? If one of these numbers which you interdict be the true answer to the question, am I falsely to say some other number which is not the right one?–is that your meaning?’ –How would you answer him? I dare say that I may, notwithstanding the danger, if upon reﬂection I ap- prove of any of them. Done to me!–as becomes the ignorant, I must learn from the wise– that is what I deserve to have done to me. Yes, he replied, and then Socrates will do as he always does– refuse to answer himself, but take and pull to pieces the answer of some one else. Why, my good friend, I said, how can any one answer who knows, and says that he knows, just nothing; and who, even if he has some faint notions of his own, is told by a man of authority not to utter them? The natural thing is, that the speaker should be someone like yourself who professes to know and can tell what he knows. Will you then kindly answer, for the ediﬁcation of the company and of myself? Glaucon and the rest of the company joined in my request and Thrasymachus, as any one might see, was in reality eager to speak; for he thought that he had an excellent answer, and would distinguish himself. But at ﬁrst he to insist on my answering; at length he consented to begin. Behold, he said, the wisdom of Socrates; he refuses to teach himself, and goes about learning of others, to whom he never even says thank you. That I learn of others, I replied, is quite true; but that I am ungrateful I wholly deny. Money I have none, and therefore I pay in praise, which is all I have: and how ready I am to praise anyone who appears to me to speak well you will very soon ﬁnd out when you answer; for I expect that you will answer well. Listen, then, he said; I proclaim that justice is nothing else than the interest of the stronger. And now why do you not me? But of course you won’t. Let me ﬁrst understand you, I replied. justice, as you say, is the interest of the stronger. What, Thrasymachus, is the meaning of this? You cannot mean to say that because Polydamas, the pancratiast, is stronger than we are, and ﬁnds the eating of beef conducive to his bodily strength, that to eat beef is therefore equally for our good who are weaker than he is, and right and just for us? And the different forms of government make laws democratical, aristocrat- ical, tyrannical, with a view to their several interests; and these laws, which are made by them for their own interests, are the justice which they deliver to their subjects, and him who transgresses them they punish as a breaker of the law, and unjust. And that is what I mean when I say that in all states there is the same principle of justice, which is the interest of the government; and as the government must be supposed to have power, the only reasonable conclusion is, that everywhere there is one principle of justice, which is the interest of the stronger. Now I understand you, I said; and whether you are right or not I will try to discover. But let me remark, that in deﬁning justice you have yourself used the word ‘interest’ which you forbade me to use. It is true, however, that in your deﬁnition the words ‘of the stronger’ are added. Great or small, never mind about that: we must ﬁrst enquire whether what you are saying is the truth. Now we are both agreed that justice is interest of some sort, but you go on to say ‘of the stronger’; about this addition I am not so sure, and must therefore consider further. I will; and ﬁrst tell me, Do you admit that it is just or subjects to obey their rulers? And the laws which they make must be obeyed by their subjects,– and that is what you call justice? Then justice, according to your argument, is not only obedience to the in- terest of the stronger but the reverse?